Pear baked in honey laced with butter. I had to start with the basics for this one. And I’m so glad I did! Bosc pears are an aristocratic fruit. A ripe Bosc pear has a sweet,somewhat spicy refined taste and is buttery smooth on your tongue. They are firm and more densely textured than other pears so hold their shape beautifully when cooked. Their shape is elongated and elegant. They can be distinquished by their unique soft cinnamon bronzy skin. Bosc (pronounced “Bawsk”) pears are available beginning in September through the winter months until mid-spring. Of French origin, most Bosc pears purchased in the US are grown in Washington and Oregon. In Europe, they are known as Kaiser Alexander Pears. This was the first time I ever baked a pear. Big mistake – waiting this long to try it! Superb! The honey and the butter added just the right touch to the regal flavor without overwhelming the pear. I peeled the pears because I thought it would be more photogenic, but peeling is not necessary. Just wash thoroughly and place in the baking pan, spoon honey butter over the fruit and cover with foil. I used a thick dark organic honey because that is what I had on hand and checked after about 45 minutes to make sure the thick honey was not caramelizing. I turned the oven off and just let the dish set in the hot oven for the rest of the hour. A lighter, more viscous honey will produce a lighter flavor and will not be as likely to caramelize – but I would still check and use the opportunity to spoon the butter honey over the fruit again. You can serve this hot from the oven. 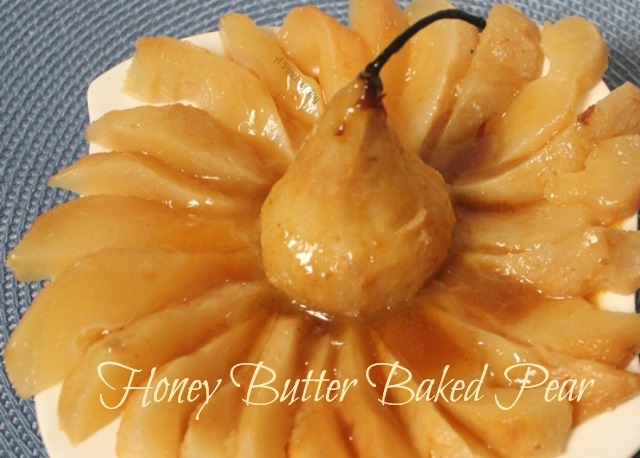 Just place a whole pear on individual plates and divide the honey butter between the four servings. Or you can let it chill in the refrigerator overnight, slice three of the pears and arrange them on a plate around the whole fourth pear for a fun and “fancy” presentation. Serve cold, but warm the honey butter mixture in the microwave for a minute and spoon it hot over the cold pears just before eating. This simple dessert was a big hit! Turn oven to 375 degrees F.
Peel pears carefully, leaving stem intact. Wash thoroughly if leaving skin on is preferred. Cut a small slice from the bottom so pears can stand up. Place in shallow baking dish. Melt butter 20-30 seconds in the microwave and stir in honey and ginger until honey melts and combines with butter. Drizzle pears with honey mixture, using it all. Cover baking dish with aluminum foil, tear open just enough space for stems to stick through the foil. Bake in heated oven (may not be fully preheated yet, but that’s okay) for about an hour or until pears are tender. Baste with juices and honey mixture once or twice near the end of the baking time. Serve whole pears hot, drizzled with honey mixture. OR chill overnight and slice each pear into eights, drizzle with honey mixture that has been heated in the microwave for 1 minute before serving cold. What a lovely presentation for your Baked Pear, it looks delicious. Hope you have a great weekend and thanks for sharing your tasty recipe with Full Plate Thursday. How gorgeous this looks ! !